Heading home it all heads south. I had gone to bed early on Sunday after the grand prix to make sure I wasn’t going to miss my early morning train. Unfortunately, it seems that Trenitalia and the SNCF (France’s train system) don’t do much to co-ordinate their schedules. I had a ticket on a TGV train from Nice to Paris at 10:41. To get to Nice, I would have to travel from San Remo to Ventimille, then to Nice from there. I worked backwards to figure out the schedule. 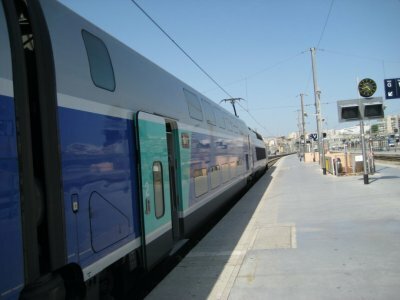 There was a train arriving in Nice from Ventimille at 10:42, a minute after my TGV train was scheduled to leave. The train before that arrived at 9:42, leaving Ventimille at 8:55. I’d have to wait 59 minutes in Nice to catch my train. 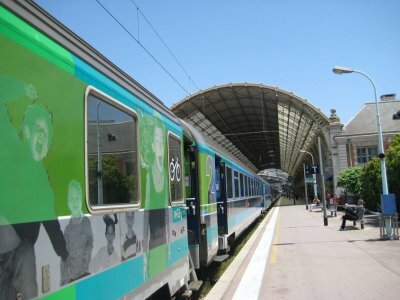 To get to Ventimille, there was a train arriving at 9:00, 5 minutes after the train to Nice had left. 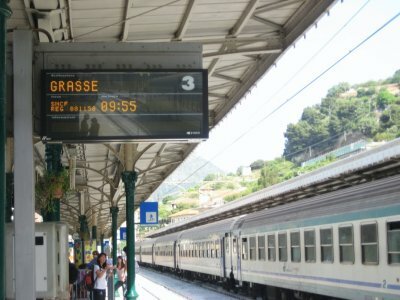 The next earliest train, according to the schedule in the San Remo train station was an 8:07, arriving in Ventimille at 8:23, giving me a wait of 32 minutes in Ventimille. I arrived at the San Remo train station just before eight with more than 10 minutes to spare. I looked up at the train schedule, and noticed that there was no 8:07. The next train was the 8:43. 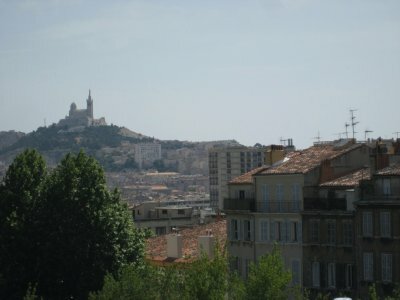 The knock on effects were that I would miss my train to Nice, and then my train to Paris. I don’t know why, but the 8:07 train ONLY runs on Sundays and holidays. On weekdays, there is no train at that time. On weekdays, they have LESS train service than on Sundays. I have never heard of such a thing. I was flabbergasted. 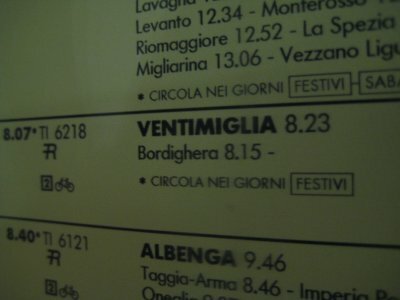 I caught the 8:43, and by the time I got to Ventimille the 8:55 had already left. My only hope was that the 9:55 to Nice would show up a few minutes early, or perhaps the TGV would be a few minutes late. It was not to be, though. 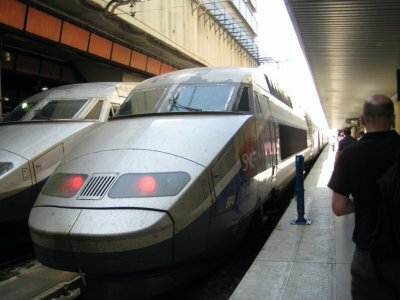 The 9:55 to Nice got delayed, and arrived a full 10 minutes after the TGV to Paris had already headed out. At first I tried to rebook using one of the automated machines. Working the machine was amazingly easy, unfortunately the options it gave me weren’t great. The earliest departure was at 16:30 getting to Paris close to 10 at night! That would be well past the time when the last Eurostar would have run to London. If I got that train, I would have to spent the night in Paris. Worst, there was a plan for a National Strike in France the next day, which means if I got stuck in Paris for the night, I might not be able to get out the next day if the metro or Eurostar weren’t running because of the strike. I thought about ditching the trains and heading to the airport, but instead decided to give a human a try and see if I could get an earlier train. I pressed the CANCEL button, and the machine tells me to retrieve my ticket. The ticket, however, doesn’t come out of the machine. I bend down and look into the ticket slot. I can see my ticket jammed and crinkled, stuck in the machine. I try and pry it out with the tip of my driver’s license, but it won’t come out. After a minute, the machine’s screen goes bright blue and declares itself out of order. I spits out a little slip of paper and tells me to go and see a human. “Great, that was what I was planning to do anyway,” I think. 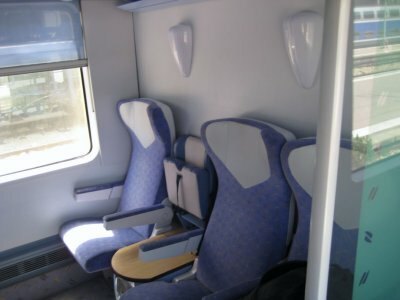 Luckily, the agent who served me was very nice and friendly, and was able to get me a much better train. She got me on a train from Nice to Marseille, and then from Marseille to Paris, arriving into 19:31, 50 minutes after my Eurostar train to London was scheduled to leave. I went down to the internet cafe and rebooked my Eurostar for 20:41, one hour and ten minutes after arriving. All I would have to do is get from Gare de Lyon to Gare Du Nord in that time, a trip that shouldn’t take more than 10 minutes. The train to Marseille was interesting. It was the first train I’d ever been on that had a children’s play area. Once in Marseille, though, things go wrong. The train to Paris leaves 40 minutes late, and I arrive in Paris with only 30 minutes to get to Gare du Nord. Eurostar tells you to show up 30 minutes early to check in and clear customs, so already I am late. I jump on the RER train, but it chooses to sit in the tunnel rather than transiting across Paris, so I wind up missing my second scheduled Eurostar departure of the day. Once I arrive at Gare du Nord, I get rescheduled and finally get home at 10:30 PM, 3 hours late and more than fourteen hours after first leaving San Remo. So, should I have flown? It would have been quicker, for sure. But despite all the problems, I only wound up getting back 3 hours later than scheduled. I am not sure I could have said the same had I flown. The train, even though the overnighter was a bit like a dorm room, still had a certain touch of glamour that planes don’t have. And because most of the trains in France run on nuclear power, I did end up saving a few gallons of fuel that didn’t have to be used on flying me around. As we all know, oil is a limited resource and is running out. By not using that fuel for the plane, perhaps they’ll be able to run a few more race cars around the track at Monaco, and keep alive the glamour. The glamour and the gasoline.